Two bullet casings that might have proven an FBI agent shot at Robert “LaVoy” Finicum apparently disappeared from the scene shortly after the Jan. 26 highway confrontation turned deadly, according to law enforcement sources and newly released police reports. Five FBI agents assigned to the traffic stop told investigators that none of them fired at Finicum’s Dodge pickup after it crashed at their roadblock. Oregon investigators, however, concluded that one agent fired twice at the truck, hitting it once in the roof and missing on the second shot. A state trooper later described to investigators seeing two rifle casings in the area where the agents were posted. Detectives tasked with collecting evidence didn’t find the casings, police reports indicate. FBI aerial surveillance video shows that before the detectives could get there, the FBI agents searched the area with flashlights and then huddled, according to law enforcement sources who have seen the video. The group then broke and one agent appeared to bend over twice and pick up something near where the two shots likely were taken, the sources told The Oregonian/OregonLive. The findings fill gaps left by authorities last week when they released the results of their investigation into Finicum’s death. Deschutes County Sheriff Shane Nelson and Malheur County District Attorney Dan Norris, who supervised the investigation, said two state troopers were justified in using deadly force to stop Finicum, one of the leaders of the takeover of the Malheur National Wildlife Refuge. They also announced they had evidence that an FBI agent fired at Finicum’s truck but didn’t disclose the shots. The agent and four of his colleagues then took “specific actions” afterward, they said, but offered no other details. Nelson and Norris alerted federal officials to their findings. The FBI agents now are under criminal investigation by the U.S. Justice Department’s inspector general. Former FBI agents and criminal justice experts have said they’re baffled why elite FBI agents might hide the shots. He declined comment Tuesday “to preserve the integrity” of the federal investigation. Finicum’s shooting came after FBI agents from the national Hostage Rescue Team and state troopers stopped leaders of the Jan. 2 refuge takeover as they were bound for a community meeting in John Day, 100 miles north of the bird sanctuary. Finicum was driving his 2015 Dodge truck that also carried Ryan W. Payne, 32, of Anaconda, Montana, Ryan C. Bundy, 43, of Mesquite, Nevada, Shawna J. Cox, 59, of Kanab, Utah, and Victoria Sharp, 18, of Lakeside, Montana. In a Jeep behind them were Ammon E. Bundy, 40, of Emmett, Idaho, Brian “Booda” Cavailer, 44, of Bunkerville, Nevada, and Mark C. McConnell, 37, of Buckeye, Arizona. All three men in the Jeep surrendered as did Payne in Finicum’s truck. But then Finicum took off, crashing into a snowbank along U.S. 395 when he encountered a police roadblock. He got out and two troopers shot him from behind when they saw him reach into his jacket while turning toward a third trooper armed with a Taser. Finicum later was found to be carrying a loaded 9mm handgun. The episode was captured on FBI aerial surveillance video. Two days after the shooting, FBI officials released a 26-minute segment of the video to quell rumors about how Finicum died. But the video continues for another hour, law enforcement sources said, capturing the subsequent actions of the FBI agents. The police reports show that investigators, who saw the full FBI video the day after the shooting, suspected something was amiss. They searched two FBI pickups used at the roadblock, looking for bullet casings, according to a detective’s report. They didn’t find any. In the days following, detectives asked at least three state troopers what bullet casings they had seen after the shooting and whether they had seen anyone pick them up. One trooper – identified only as Officer 5 – told investigators that he saw two rifle casings in the area of the roadblock. He described them both as copper-colored. The color of the casings could be a crucial detail. Troopers use state-issued ammunition that comes in silver-colored casings. At the time Finicum crashed, four FBI agents were posted at the roadblock. One was nearly run over by Finicum and two more were between an FBI pickup and Finicum’s now-stopped truck. A state trooper also was nearby after firing three shots as the Dodge roared toward the roadblock. The shots hit the truck, but injured no one. Police reports document that detectives didn’t arrive at the roadblock to collect evidence until just before 7 p.m. on the day of the shooting. That was nearly 90 minutes after the FBI video showed the agents looking around where they had been posted. Evidence logs don’t list any copper casings found at the scene. Investigators later concluded that an FBI agent fired at Finicum after they examined the truck and cellphone video taken by Shawna Cox as she sat in the back seat of Finicum’s truck. They said they could account for three bullet strikes on Finicum’s truck coming from a trooper who was trying to stop the speeding pickup. They couldn’t account for a fourth bullet through the roof. Forensic specialists from the Oregon State Police conducted a ballistic trajectory analysis to determine the path of the bullet. Their calculations produced an estimate that traced the path back toward where two FBI agents were standing at the time the shot was fired. They pinned down that instant by synchronizing the moment when the Cox video recorded the round striking the truck with the overhead FBI video showing the location of all the officers. State police specialists typically use trajectory rods and protractors to calculate a bullet’s path. Such trajectory analysis is standard police practice. Michael Haag, a national ballistics expert with the Albuquerque Police Department, hasn’t studied the Finicum case but explained the trajectory procedure. A bullet hole alone usually won’t determine the caliber of a round or the distance it traveled, he said. A trajectory rod – plastic or metal – is fitted into the bullet hole and then aligned with a second hole created by the bullet, he said. Specialists then calculate the trajectory. They usually add a margin of error of 5 degrees either way — a national standard — and then graph a cone expanding out from the hole toward the source of the shot. The investigators last week released an image of the trajectory cone for the hole in the truck roof. The Oregonian/OregonLive independently applied that cone to the FBI’s overhead video and the Cox video at the time the shot struck the roof. 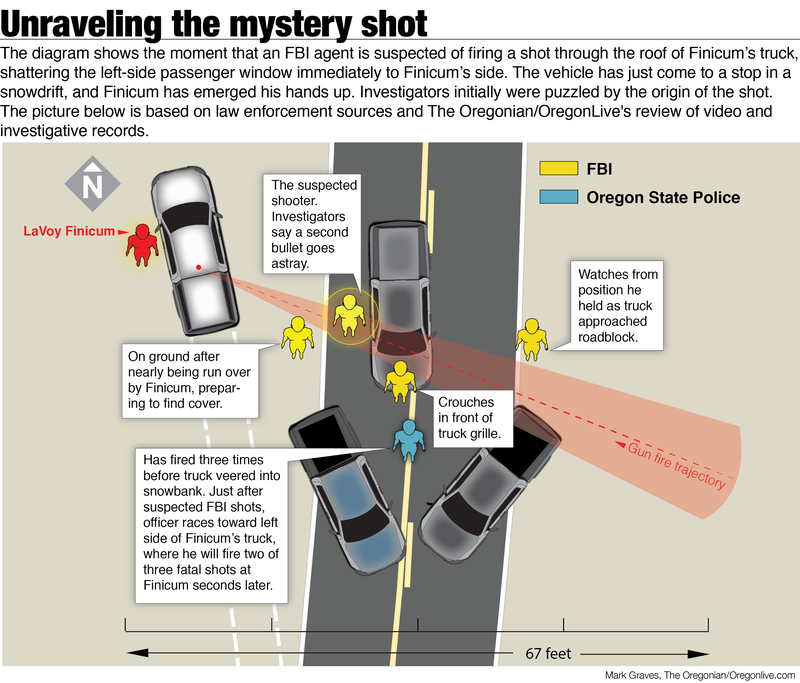 The resulting image placed one FBI agent in the trajectory roughly 15 feet from Finicum’s pickup. A second agent, standing behind him, also is partially in the cone. Investigators, using precise measurements of vehicle locations and law enforcement positions, concluded that the first agent was the one who fired into Finicum’s roof. The FBI video shows two other FBI agents nearby as well as the state trooper who fired three times at Finicum’s truck. None of those three is near the trajectory plotted by forensics experts. Investigators checked the trooper’s weapon after the shooting to account for the rounds he said he had loaded. According to his interview transcript, he had 29 rounds in his AR-15 before the shooting. The police inventory showed his rifle had 24 rounds afterward, accounting for three shots at the truck and then two at Finicum. Weapons carried by the FBI weren’t checked because no one saw an agent shoot and none said they had, law enforcement sources said. A law enforcement sketch shows the first several shots fired at the truck driven by LaVoy Finicum. Officials release results of the police investigation into the death of Robert “LaVoy” Finicum at the Deschutes County Sheriff’s office, Mar. 8, 2016.